Today, you’re going to learn of the best way to make money with Pinterest. 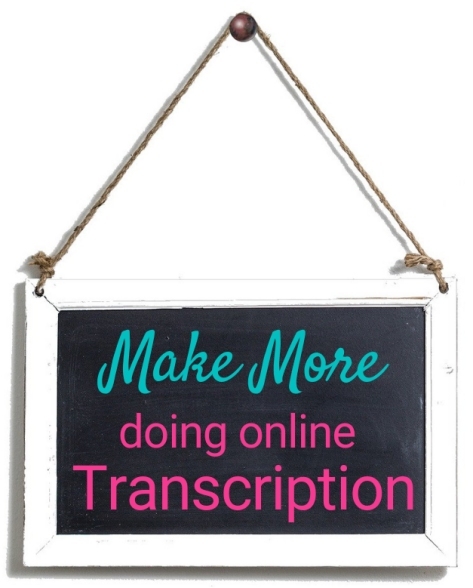 It’s a goldmine side gig that can have you earning thousands of dollars each month. It’s nothing like one of these easy ways to make money online kind of gigs. They’re too “iffy” as far as steady money-making goes. And I’m definitely not talking about promoting affiliate links. 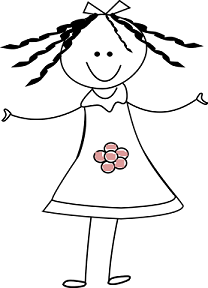 You need A LOT of people to see your Pins – people interested in what you’re “selling”. I’m talking about making money as a Pinterest Account Manager for bloggers. Working just a few hours a day…or week. Few hours as in part-time, after your 9-5 job, whenever-time. Your call. And what’s even cooler: you can get started just about NOW. I call this is a goldmine gig because just about ALL BLOGGERS TODAY USE PINTEREST TO MARKET THEIR BLOG. But it takes them away from blogging. 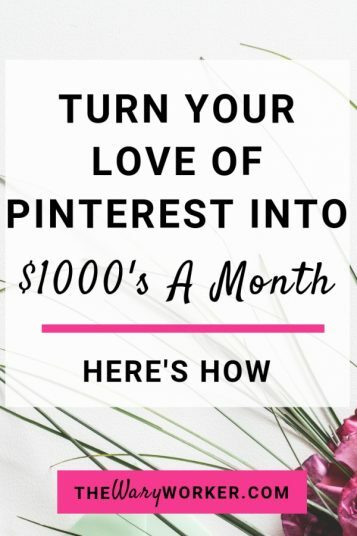 So they pay people to manage their Pinterest account for them. Getting into guinea pig mode, I wanted to see what makes a Pinterest account manager. What’s needed, how much money can be made and how to be good at it. First, Why Is It A Goldmine Gig ? Speaking for myself, there’s not enough hours in the day to manage my Pinterest account. I’m a blogger who would rather write than create Pins. I can write a post in 4 hours but spend at least 2 hours trying to create a nice looking Pin worthy of getting traffic to that post. And trying to promote that same Pin ? More time spent on Pinterest. All bloggers want more internet traffic. More traffic means more income. Bloggers are NOT Pinterest Managers…we blog. 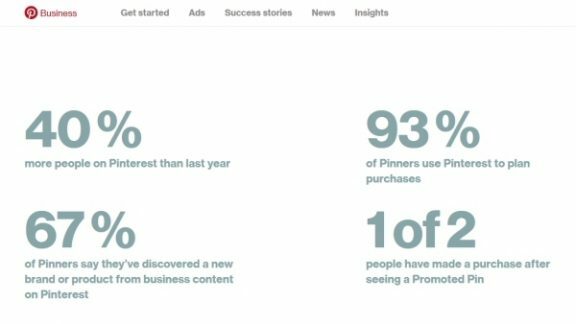 And because 93% of Pinterest users plan their purchase after visiting a Pin, Bloggers need that action. And that’s why bloggers pay people to do their Pinterest management for them. What Experience Is Needed ? Very little, if any ! That’s the beauty of this gig. You don’t need a ton of experience. You don’t need to be technical, you don’t need a website, and you don’t need to have a Pinterest following. But you should know how to use Pinterest. And if you don’t know how to use Pinterest, you need to want to learn. Don’t worry, I’ll have resources below where you can learn. A Pinterest Manager creates, updates, and pins content to Pinterest boards. This also may include setting up Pinterest accounts, creating and organizing boards, joining group boards, and creating graphics. Like any job, the better you are, the more you can potentially make. Scanning through some of the freelance platforms it looks like the average rate paid for Pinterest management to be over $37.00 an hour. Pretty darn good if you ask me. How to create and Edit Pins. Canva is a great, free Pin creator. It’s easy to use, too ! Published by Kissmetrics, a very well respected social media firm, this is a lengthy read but there is so much information here. Even though this article is about your Pinterest account, all the information is actionable for anyone’s account. So, as a Pinterest Manager for any business or blogger, you’re stocked with great advice. And the most important factors to get more followers. In my opinion, the #1 social media learning blog, Social Media Examiner is “your guide to the social media jungle”. Another long article but packed with a ton of tips to get Pins noticed. This article shows you how to research the best search terms for any Pin you have as well as how to optimize boards and profiles. These blog posts are GREAT for learning a lot of the ins-an-outs of Pinterest and they’re written by trusted sources. I refer to them all the time as I build my own Pinterest account. But let’s be honest here: the freebies only get you so far. We read about how to set up boards, how to make pins, how to SEO the Pins, how to use automated Pin scheduling tools. All fine and good, but some important stuff is missing. What’s a Pinterest side-gigger to do ? Get into the nitty-gritty with this Pinterest course. It goes through all the steps to set up a successful Pinterest plan for your business; steps which can be used to manage ANY business or blog – not just yours. 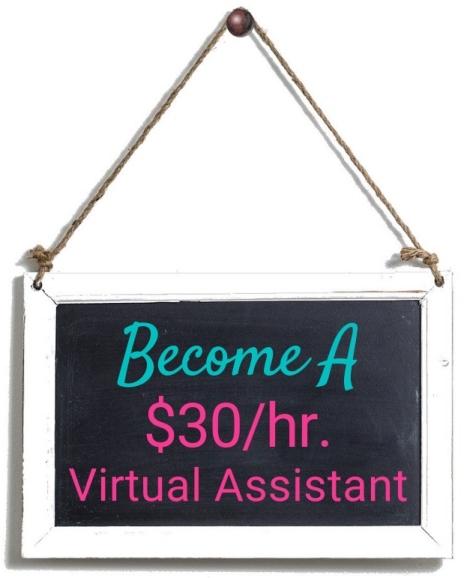 And to pull it all together so YOU CAN START MAKING MONEY WITH THIS GOLDMINE, another info.-packed resource I like is this easy to comprehend course on how to be a Virtual Assistant because a Pinterest Manager is a specialized niche of virtual assisting. One of the things I really like about this course are all the worksheets, forms, and templates. Worksheets to help figure rates and costs, forms to help figure out client needs, templates to write awesome proposals that get you hired. Second, you need to be OK with being a freelancer. There are two routes you can go, here. One way is by using the simple freelance platforms, like Upwork. The other is by expanding beyond the freelance platforms and utilizing a blog and marketing techniques needed to be a full-fledged Pinterest entrepreneur. Either way, getting started is easier than you think, thanks to the internet. BUT FOR THE PURPOSE OF THIS PINTEREST SIDE GIG, I’M GOING TO FOCUS ON USING FREELANCE PLATFORMS. 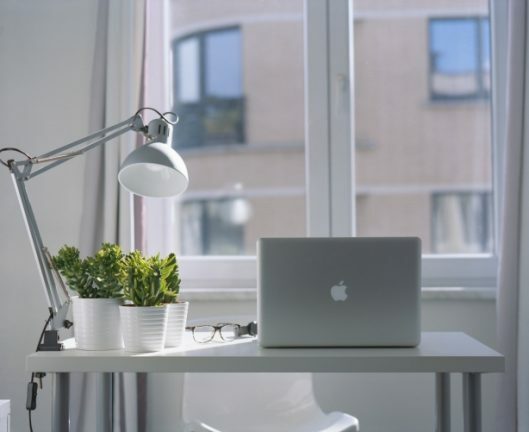 Let’s take a look at the online freelance platform Upwork. 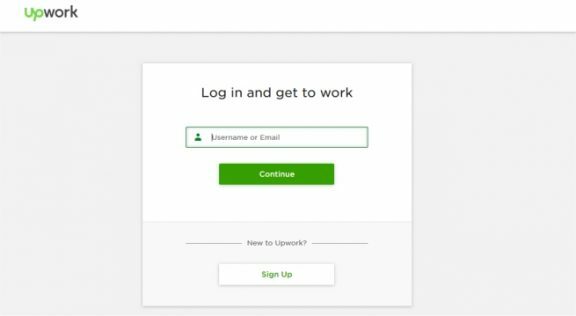 Here’s how to get started on Upwork (or just about any other freelance platform out there, for that matter). Do some research. Scout-out some of your potential competitors, aka other people doing Pinterest management. 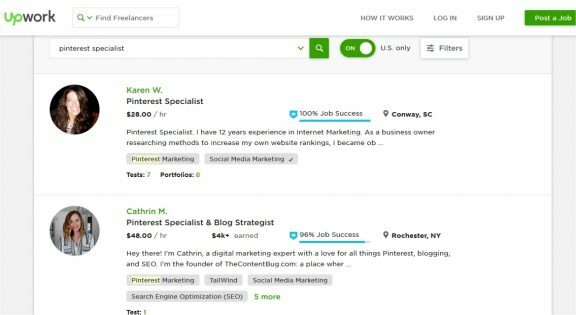 Type the word Pinterest in the Find Freelancers box next to the Upwork logo. Take a look at the profiles of the Pinterest and Social Media “specialists” to see how they wrote their profile and what they charge. You’ll get some ideas on how you can craft your profile. Set Up Your Profile. Ok, now that you’ve read through some competitor profiles, it’s time to craft one for yourself. Write out a rough draft of what you can do for your (potential) clients. You’ll probably re-write it a few times until you get it just right. Write about your experience, your training, your knowledge of Pinterest. Let it shine how you can add value to their business. Your profile is also the place where you set your rates. When you’re happy with your profile, publish it on Upwork. Now on to the third step. You’ll need to pitch yourself and your services. Upwork makes this easy – clients post their job and you send them a proposal. BUT you have to pitch your services so you win ! Which is where your awesomely-written profile comes into play. It’ll help “sell” you. So, to see who needs someone to manage their Pinterest account, log into your Upwork account. Then enter something like Pinterest VA, Pinterest Virtual Assistant, Pinterest Marketing or Pinterest Manager in the Search For Jobs box. There you go ! See all those people looking for you to do their Pinning ? Now, go ahead and read through their needs and requirements. Pick the clients you’d like to work with, send them a proposal and be sure to let them know how you can add real value to their project. Now I’ll admit, pitching is not always fun. You’ll get a lot of no’s…and by “no” I mean your proposal will be ignored. But you’ll get some yes’s, too. Ready To Be A Pinterest Manager ? This is by far the most legitimate way to make money working part time on Pinterest. As a side earner, you’ll still have time to do what you normally do and make enough money to quit your day job. At least that’s the goal. Are you ready to get started today ? 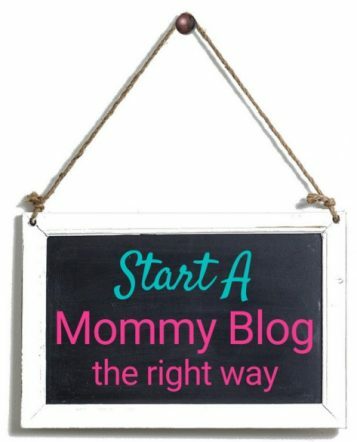 As a blogger I’d love it if someone took over all of my Pinterest work, just can’t yet afford to outsource it! 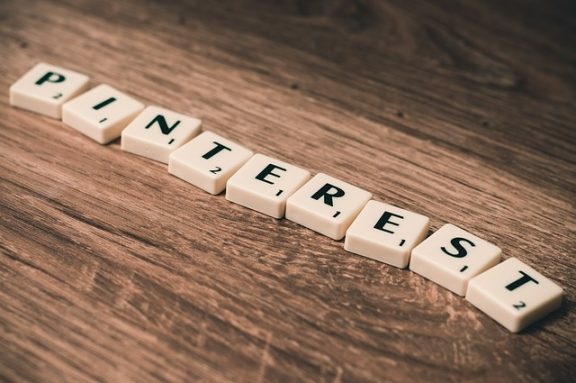 You’ve really covered the detail in this post, someone wanting to get into Pinterest management has got a head start if they follow this advice.